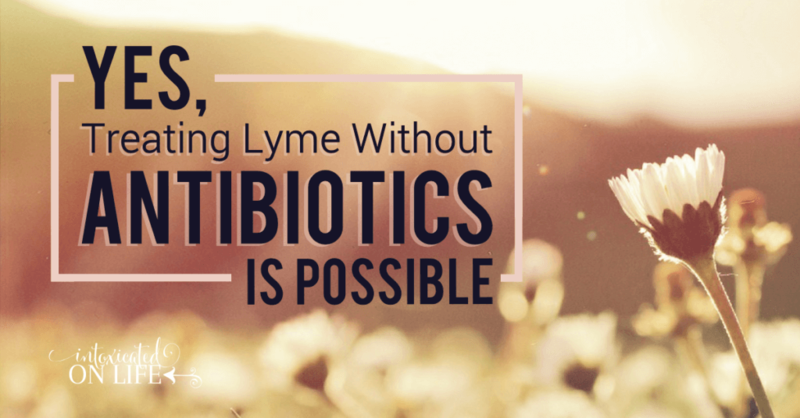 Yes, treating Lyme without antibiotics is possible. Let’s take a closer look at how you can do this. There’s a lot of conflicting information out there about lyme disease. Lyme isn’t a chronic condition vs. Lyme can certainly be chronic. Just take antibiotics for a few weeks and you’ll be cured vs. Take antibiotics for years, but you still won’t be cured; it will just be in remission. Antibiotics are the only thing that works for Lyme vs. Antibiotics don’t work well for treating Lyme. Lyme can be cured vs. Lyme can’t be cured. It’s enough to make your head spin. And to make things worse, if you’re the unlucky one with the Lyme diagnosis, you’re probably not thinking all that clearly due to the intense brain fog. What’s a girl to believe? Trust me, as I waded through the information, I was thoroughly confused. If you read my post about beginning Lyme treatment, you’ll understand how conflicted I was. With the help of a fantastic doctor, and the encouragement of a dear friend who pushed me to just do something, I started treatment for my Lyme disease about 18 months ago. I started Lyme treatment trepidatiously without antibiotics—the medical community’s gold standard treatment for Lyme. I’ve been treating Lyme without antibiotics for about 18 months. For some, that might sound like an eternity. For those who have been struggling with Lyme, you probably know that’s really not a lot of time to be treating this horrific disease. I still don’t know all of the answers. But I do know, that a no-antibiotics approach to Lyme treatment has worked remarkably well for me. After 18 months, I am probably about 80% better. I’m pretty ecstatic about the progress I’ve made. I feel blessed that I’ve experienced this much healing. Early on, I hit Lyme really hard. I did absolutely everything my doctor suggested. It was a lot. It was expensive. But it paid off. My initial Lyme test was, in the words of my doctor, “lit up like a Christmas tree.” Pretty much everything on it was positive: 2 different strains of Lyme, babesia, bartonella, and mycoplasma. I was a mess. This summer I had a repeat test. Everything came back negative. While this doesn’t mean I’m definitively negative for Lyme, it certainly indicates we’ve been able to reduce the load enough that it’s not showing up on the tests. I’ll likely need to continue some level of treatment for quite some time. There are many Lyme specialist who don’t believe it’s ever possible to be completely cured of Lyme. It’s a sneaky bacteria and good at hiding. Many believe, the best you can get is to effectively put yourself in remission and strengthen your immune system. This keeps the Lyme bacterial load low enough that the symptoms are kept at bay. Another fantastic result of treatment has been a huge decrease in inflammation. My c4a levels (a measure of inflammation) were 20,749 when I was first diagnosed. That’s a lot. (In case you’re wondering, “normal” levels are considered around 2,830). At the beginning of this year, after about a year of treatment, they were down at 17,594. This September, I was delighted to see my levels down to 4,090. I’m inching closer to being back in the normal levels. My treatment protocol has changed a lot over the past year. The doctor I had initially been seeing for treatment moved off to California, necessitating a change in doctors. We’ve eased off the intensive Lyme treatment and have been working more on decreasing inflammation. Byron White Herbal Formula AL Complex: I’m using AL Complex as continuing Lyme treatment. This formula is designed to help support and activate the immune system against the Lyme bacteria. Low Dose Naltrexone (LDN): I began using the LDN with the hopes that it would help even out my sleep. I’m not sleeping as much as I used to, though still more than most adults. We are continuing it because it’s been shown to help decrease inflammation and normalize the immune system. Bovine Colostrum: Much like colostrum from humans, bovine colostrum is packed full of good stuff. It’s high in antibodies which help infections. And it’s also known for boosting the immune system and decreasing inflammation. I also take NatureThroid for my hypothyroidism and several vitamins: vitamin C with flavanoids, D, K, Magnesium, Methyl B Complex, and Iodine. I’ve continued to include a number of detox protocols in my routine including the Des Bio Detox and Cleanse, my portable infrared sauna (read more about using an infrared sauna for detox here), detox baths, and try to incorporate herbs that are good at detoxifying the body as well. What’s the Best Treatment Route? No one knows for certain the best way to treat Lyme disease. Find a doctor that specializes in treating Lyme. Find a doctor that will treat you individually and focus on your specific problems. They are far and few between, but when you find a good one, they’re worth their weight in gold. I’d encourage you to use the physician referral form on the ILADS website. You can also get many fantastic recommendations from one of the many Lyme facebook groups. 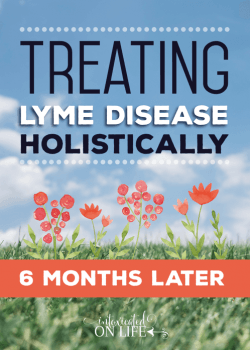 While I found treating Lyme without antiobiotics possible and I am doing well, you should figure out the best healing process that works best for YOU with the help of a doctor that specializes in Lyme. i was diagnosed with Lyme and some coinfections in Dec. I have a question for you. Did you take any Lyme Mycostis or Lyme Nosodes? I ‘m uncomfortable taking infected tick stuff, and other stuff that I’m fighting in my body already. It does make some sense, but I wanted to know if it worked for others, also Teasel Root? has anyone got back to you with a response? Would you mind sharing who your initial practitioner was that helped with Lyme, who moved to CA? I currently live in CA and an desperately looking for a LLMD, with little to no success. Feel free to shoot me an email at [email protected] and I’d be happy to share more info.